Our fundraiser is heading to €15,000! Please help us get there, by supporting Irish Motor Neurone Disease. Thank you! YOU CAN NOW DONATE UNTIL 30 APRIL 2019! 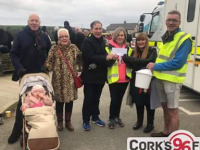 Our "Sing Or Swim" for Noel Shannon, at Fountainstown Beach, Cork saw a huge turnout, with €5664 DONATED DIRECTLY ON SATURDAY, JANUARY 5!! Thanks enormously to the Defence Forces for tents, food, soup, drinks & cheerful chat, and to the many who helped organise and run the event. Noel had a great time, met hundreds of friends and supporters, and with fine weather we saw over 120 people brave the balmy Irish winter sea, lol. 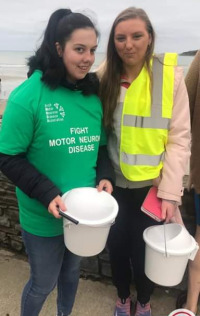 YOU CAN STILL KEEP GIVING, THANK you, with all proceeds going to Irish Motor Neurone Disease Association, which supports those suffering this disease, and their families and communities, who are also of course affected. Help us out by donating whatever you can - simply click the Donate button above. All donations are processed securely. You can also share this page using the Share options below. @susankeoghnews @ProjectMineIRE @NewstalkFM @BreakfastNT @goodrunireland Incredible interview!! Well done! Congratulations on this fantastic initiative! Fair play to Noel and everyone. I have sadly had a family member with this disease so I know first hand how tough and horrible it is. I wish ye all the best!